having a deep or unusual knowledge of; to make known . . .
At the Studio, everything is meticulously crafted by hand. 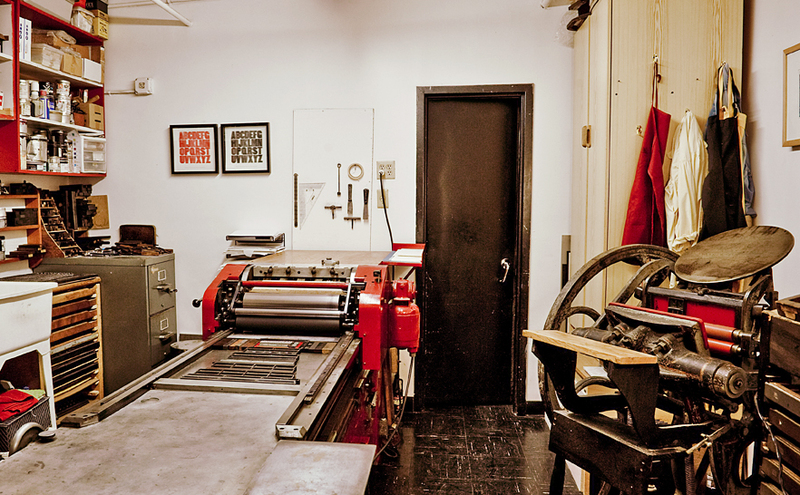 Traditional printing is done on a vintage Vandercook Universal III press. For custom designed work, Mindy combines the highest quality classic printing with modern technology. This may include hand setting 3-dimensional type, utilizing digital design for photopolymer or engraving plates, art prints with linoleum blocks, or layering of painterly techniques. On the intaglio press, monoprinting, transfer printing, etching and drypoint prints are created; and techniques such as pochoir, digital imaging, photography, and painting are all done at the Press, as well as editioned prints, portfolios, hand bindings and custom boxes. A native New Yorker born in Brooklyn, all of Mindy’s artwork and printing reflects her keen eye, extensive knowledge of art history, and wide-ranging skills: fine letterpress, painting, drawing, photography, printmaking, installation art, welding, sculpture, glass blowing, woodworking, writing and poetry. Mindy has numerous years as an art educator and university art professor (The New School Writing Program, Palmer School of Library Science, School of Visual Arts, Women’s Studio Workshop, Pyramid Atlantic, the Center for Book Arts, the Metropolitan Museum of Art, Florida Atlantic University, New York University, San Francisco Art Institute) and experience as a curator, panel moderator, and lecturer. Reviews and Publications from 1986 to present, include PARENTHESIS · Fine Press Book Association 2019, 2016, 2009; and THE NEW YORK TIMES Art Review by HOLLAND COTTER, 1994, on "WITNESS" mixed media installation at THE BRONX MUSEUM OF THE ARTS, NYC; and many more in between (please inquire).